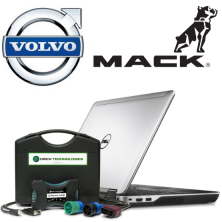 Volvo & Mack factory diagnostic software to support 1998 & newer Volvo trucks. Includes one license & client ID to allow for servicing both Volvo & Mack trucks. Rather than requiring the Volvo & Mack software to be purchased separately it’s now available as a bundle. Also includes one year of free updates & technical support.